Junior Danny Biega was named the ECAC's best defensive defenseman this week. 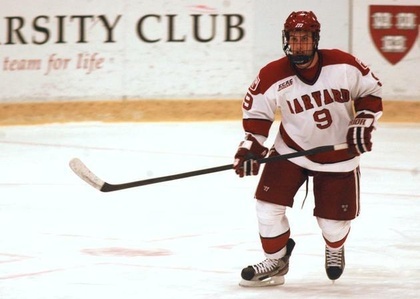 After a string of underwhelming seasons, the Harvard men’s hockey team righted the ship in 2011-12 and stood poised to claim two of the ECAC’s most prized awards. Junior defenseman Danny Biega was one of two finalists for ECAC Hockey Player of the Year after tallying 34 points in 32 contests, which put him second in the nation among defenseman with 1.06 points a game. Behind the bench, Crimson coach Ted Donato ’91 turned a squad some pegged to finish last in the 12-team ECAC into a title contender and became a finalist for the Tim Taylor Award, which honors the league’s top coach, in the process. But at Thursday night’s ECAC awards banquet, neither Biega nor his coach came away with their prestigious accolade. Colgate’s Austin Smith bested the Crimson blueliner while first-year Union coach Rick Bennett topped Donato. To some, Bennett’s victory did not come as a surprise. Rounding out the accolades, rookie defenseman Patrick McNally was named to both the All-ECAC Third Team, and, along with freshman goaltender Steve Michalek, the all-conference all-rookie team. The last time the Crimson boasted two representatives on the all-rookie team was the 1997-98 season. At that point, Michalek was four years old. And Donato was still in the prime of his NHL career.